Americans have a powerful affinity for predators. Our national symbol, the American eagle, is a flesh-eating raptor, the top predator of the skies. The pets we dote on, cats and dogs, are carnivores. We kill for them and invite them into our homes, even into our beds. When Cecil the lion was killed in Zimbabwe, we went into hysterics of outrage. 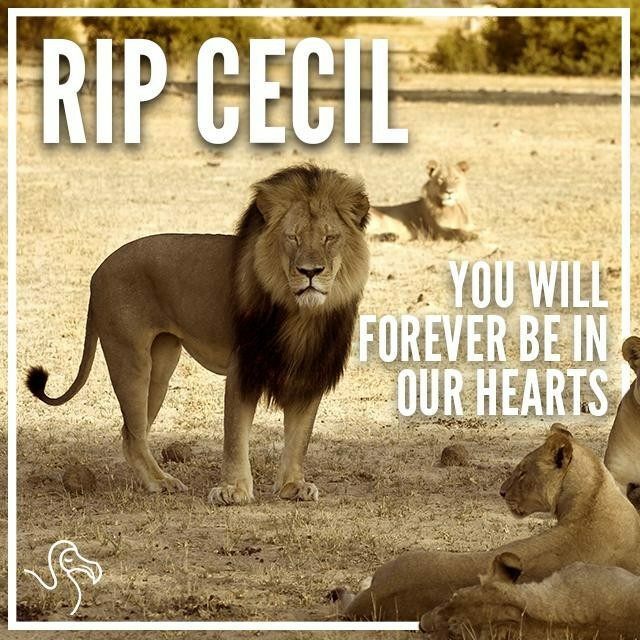 On Facebook, Cecil was described as a “noble animal.” What is noble about a four-legged killing machine? Tigers get the same kind of devoted sympathy. Even sharks have loyal fans. There has been much protest about the “cruelty” of keeping killer whales in captivity in marine theme parks. Pity the poor, mistreated flesh eaters! T. Rex is everybody’s favorite dinosaur, because of its ferocity. Never mind that the biggest dinosaurs were vegetarians. Granted that carnivores play an important role in ecological balance. Granted that some of them (wolves and coyotes) are regarded as pests if they impact someone’s bottom line. But I’m talking about emotional attachments here. And how do we treat animals that are not predators? We shoot them for sport or eat them for breakfast. We murder them by the billions, under conditions of horrible brutality, in slaughter houses across the land. With impunity; no one cares. A frugivorous animal that identifies with and sympathizes with carnivores! Why? Why don’t we identify with our own kind? Why don’t we behave like frugivores? Why do we kill for carnivores? Why do we spend more money on dog food than on cancer research? Does our affinity for predators explain our propensity for predation? For violence? Anthropologist Raymond Dart said that our ancestors were killer apes; I disagree. No doubt they sometimes had to kill for food, out of necessity, because famines were regular features of their lives. But that did not change their natures. Our closest relatives in the animal kingdom are fruit-eating apes, but they are not ferocious enough for us. We want to be at the top of the food chain. And so we are. We have succeeded in putting ourselves at the top of the food chain—the most dangerous predator on the planet. Well, I don’t know to what extent this post is meant to be satirical (certainly to some extent, I concluded). But its science is off the mark! But before I get to that, let’s talk about legality. The Great White Hunter dentist from Minnesota killed a lion that was officially protected, allegedly by having his guides lure him off the protected reserve. The great mammalian predators are all highly endangered (thank you for mentioning tigers, because they’re more endangered even than the African lion). All due to human predatory activity–habitat destruction as well as hunting. This was the source of the outrage over Cecil’s killing. I find it unfortunate that apparently the dentist will not face prosecution. Al Pacino’s character in the movie “Donnie Brasco” is watching a documentary on TV about predators when he receives the phone call summoning him to his own extinction for having screwed-up a mob affair. These documentaries have apparently become very popular on American TV (personally, I don’t watch them). Now for the science. The work of South African Raymond Dart helped inspire Robert Ardrey, a screenwriter by trade (! ), to write his book “African Genesis” in which he popularized (c. 1960?) the notion of human ancestors as “killer apes.” This book had a strong influence on my youthful assessment of the true nature of humans. (And on another movie note, Ardrey’s hypothetical description of our forebears’ behavior influenced how Stanley Kubrick depicted the ape-men, or man-apes if you prefer, in “2001 A Space Odyssey.”) When Jane Goodall started observing chimpanzee behavior in the wild, she believed these guys were indeed fructivores. What she ultimately discovered unsettled a lot of folks. Chimps CRAVE animal flesh and will gleefully kill and consume monkeys via organized hunting parties. Meat remains a minority element in their total food consumption, but the point is our nearest living primate relatives are definitely omnivores. By the way, an adult chimp living in the wild is quite strong. Humans had best hope they don’t learn how to use fire for cooking meat. “Humanburgers tonight, honey? Excellent! Do I need to run out and buy more ketchup?” With the concluding statement of Mr. Sullivan’s article I have no argument whatsoever! Oh, and for the record, I am a vegetarian since 1991, longing to transition to veganism. Chimps are like our ancestors. They “crave” animal flesh when there is nothing else available. The point is not what they eat but what their digestive systems are designed for. They do not have the digestive systems of omnivores. They don’t eat carrion, as omnivores do. They don’t have mammary glands on their abdomens. Their saliva and urine are alkaline, unlike omnivores. Their teeth are different from omnivores. Their placentas are different. Their stomachs are different. They don’t have hooves or tails. They are no more omnivores than humans are. I don’t know what sources you consult on scientific matters, but I couldn’t disagree with you more! Why do you think you–as a randomly chosen member of homo sapiens sapiens (so-called! )–have sharp canine teeth?? Do you have nothing but molars, like a cow?!? This is what Mr. Ardrey hit upon with “African Genesis.” So, will you argue that the chimpanzee “went wrong,” diet-wise, by starting to eat meat? Was this an “unnatural” predilection they developed? Do chimps die of alimentary canal-related cancers to the extent humans do? They should, if they’re polluting a digestive system that was NOT prepared to process animal flesh. Remember, our ancestors have been around for tens of millions of years. Chimps consuming meat are not an aberration; this is an evolved diet. They absolutely ARE omnivores, as are humans. And just think of all our sports teams: the lions, the tigers, the sharks, the eagles, the seahawks, the falcons, the bears, and so on. We love to name our teams after predators. Is the above choice too gloomy to contemplate, and thus likely to discourage participants from submitting an answer? Here is possibly a more palatable alternative quiz: List 5 attributes of either Donald Trump or Carly Fiorina, and rank them in the order you think GOP voters would choose to instruct their children to emulate. I won’t hesitate to respond to your rhetorical queries! Much as I would prefer to present a little smiley-face blurb of hope, and fervently would love to be proved wrong, I think the end result is already baked in the cake. Remember, our best scientists say that if the entire human race ceased polluting the air with fossil fuel byproducts tomorrow, the knock-on effects of what’s already “up there” would ensure continuing temperature increases, with their attendant droughts, raging wildfires, melting polar ice and rising sea levels for the next century or beyond. ‘Bye-‘bye for keeps, New Orleans! Just as with the issue of needing “sensible gun laws,” the POLITICAL WILL is lacking to deal with Global Climate Chaos. How wondrous the power of denial humans have evolved, eh? Your option a) will probably take us back to the very beginning, erasing all the social advances we have made through millennia. It is the best description of the human being today. The here and now that manifests in our consumerism, the absence of understanding of future consequences to our actions and the imitation of attitudes (trends?) determined by a few basically to maximize those few’s profits. Today we are mostly acting as the herd. Your option b) could be our salvation. I do not consider it gloomy. The return to the individual that uses his brain to reason his actions, that takes in consideration his responsibility to the community and probably is prepared to share in order for everybody to survive, that, to me, makes a good human being. I really appreciate positive individuality. In our evolution that was one of the biggest steps forward. As to emulation of our current politicians, I prefer to save my thoughts, they might be offensive to somebody else and for sure to most in the herd. Only one thing comes to my mind. We are supposed to be of the human animal species. Our ability to discern good from bad which implies an spiritual component is the only known factor that makes us, men, different from the other animal species. We are inferior in most of the other abilities that the rest of species possess, mainly senses. We very seldom have stopped to develop our spiritual component. On the contrary all our efforts are placed in growing stronger bodies by making our spirit weaker to achieve it. Our outlook is simply framed in the pure animal being. And the worst part is that all our efforts are centralized in imitating only the brutal animal behavior. But we are not honest with ourselves. The animal of other species – when hunting- does not use manufactured weapons but its own intelligence and senses. And only and mostly when it is hungry. We feel superior by killing a tiger with a rifle and from a safe distance. It is only a sport. I would like to see hunters and trappers using their “superior” natural strength to kill a tiger or a lion and so on. Then I would believe the animal superiority of man over other species. But men could be spiritually superior to all species if we could learn to respect them, if we could live and let live. But we cannot do that even among our own species. Graciela, I have felt this way since I became fascinated with Science as a child. The smallest, “lowest” animal has amazing skills that no human could hope to match. If a human could compete in the Long Jump in the Olympics with the leaping ability of a flea he could sail from one end of the stadium to the other! If a human weightlifter had the proportionate strength of an ant, she would totally decimate the World Records book! I could go on and on, but I’m sure the reader gets the point. But greglaxer by imitating a very limited list of abilities in animals of other species we have achieved so much advance in science and technology why do we avoid taking the next step. There is not one discovery actually created by man. We have only been copying nature. Even in the field of physics we developed our laws by watching how nature acts. The gravity, the flying machine, the lens that increases or decreases the size of objects, everything we learnt comes from teacher nature. Every time we tried to ignore natural laws we miserably failed. So, why are we so arrogant. At this point we have made so many mistakes that with the consequences of our actions we are starting to grow just a little by accepting the error of our ways. I feel that that is nature telling us to compensate our inability to function in a positive way by growing in understanding that we live in a balanced world where by breaking its basic laws we can make our road to extinction shorter. Maybe it is not total extinction because we are part of nature and nature has a function of adaptability. For sure is extinction of the human species as they are known today. That understanding that involves a short rest in the spatial time to understand the world that surround us is what I call spiritual growth. By the way now we have engineers that are specialized in observing the natural world in order to find answers for our needs. That is a big step in the right direction. What I do not see is the public school agenda being updated to prepare the children for the new world they will confront. Mark Twain observed that Man considers himself “The Creator’s Pet.” As I have noted previously, or somewhere (perhaps in my memoir, which I really ought to complete one of these days!! ), the notion that Man is apart from and superior to the rest of Nature is THE single worst, most stupid and colossally wrongheaded-with-disastrous-consequences idea a human being ever got into his head. (Yes, I’m confident it would have been a male of the species…such as the authors of the Book of Genesis and its brethren in the foundational works of religion.) By the time of those codifications of belief systems, of course, we already were developing agriculture and animal husbandry, the first time humans intentionally altered the natural order of the world. We also had an understanding that in future there would be lean years as well as “fat.” What a far, far cry from today’s attitude that technology can fix anything we manage to mess up. What sheer rubbish! Pollute Mother Earth to our heart’s content; consume, consume, consume for today’s gratification. Future generations? Don’t worry, they’ll find a way to repair the damage. Really? Like restoring the polar ice caps? That’ll be a bit of a chore. I’m speaking here of the “developed world,” of course. Untold millions of people still struggle to eke out a daily existence, sometimes surviving by salvaging the garbage discarded by the richer nations. What the latter are impoverished in, themselves, is a spiritual grasp of the real consequences of their “lifestyle.” There is some wisdom in the holy books of the Abrahamic Tradition, but it’s surrounded by so much useless verbiage and superstition that most who swear by those books as the best guides to living will miss it. (For the record, I have read every word of the Old and New Testaments as well as the Koran.) But we are ruled by Capital. Mammon is our God. And Capital is only interested in today’s profit, not long-term ill consequences for the planet and its inhabitants, human and otherwise. Great comment, by the way.